Sedgley Local History announced sad news this week when it revealed the recent deaths of two stalwarts of the local community. George Cox died on Friday, 15th February, aged 89. He was a trustee of the now closed Sedgley Local History Museum and a past president of Sedgley Local History Society with a membership dating back to the 1980s. Having worked for renowned Wolverhampton-based paint and printing ink company, Mander Brothers Limited, for 41 years, George regularly gave entertaining and fascinating talks on this prosperous period in local history. He was also a popular member of the local community, being active with 1st Sedgley Scouts from around 1960, before writing a book on their history in 1994. A devoted Wolverhampton Wanderers fan, he amassed an impressive collection of football-related memorabilia and was also a Neighbourhood Watch co-ordinator for more than 20 years. George had a strong interest in local heritage, providing the late chairman of Sedgley Local History Society, Trevor Genge, with photos and information for countless books. From 2001, he was involved in the Imperial War Museum project to record all war memorials, where he collected details and visited more than 60 sites. At Dudley’s first annual civic awards in 2004, he was awarded the Frank Foley award for community service for his work in scouting, and in June 2009 the MBE for services to the community. 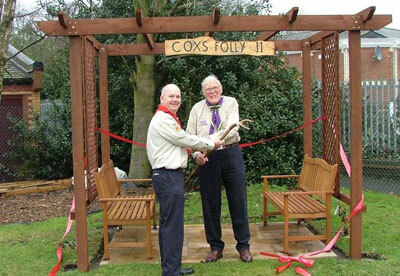 The funeral service for George Cox will take place at All Saints Church, Sedgley, on Friday, 1st March 2013 at 3 pm. Another sad loss announced by Sedgley Local History is that of Jack Wilson, who died on Saturday, 16th February, aged 94. Jack was a Labour councillor with unbroken service from 1949 until retirement in 2002. He represented his home town of Coseley on Coseley UDC (1949 to 1966, Chairman in 1959), Staffordshire CC and Dudley MBC (1966 to 2002, Mayor 1975/76). Jack masterminded the Coseley Baths project and led pioneering changes to the Staffordshire fire service and was involved in opening 14 new stations. In Dudley, as Chairman of Education, he oversaw the introduction of comprehensive education. He became a Freeman of the Borough in 1989 and was awarded an MBE in 1989. The funeral service for Jack Wilson will take place at Providence Baptist Chapel, Coseley , on Wednesday, 6th March 2013, at 2 pm.